You can be one of the few that have ever dove under a solid ceiling of ice. Imagine when you flash the Divemaster on your next Caribbean trip your PADI Ice Diver certification. Ice diving also brings Minnesota's best visibility (100 + ft is possible), a chance to play with your exhaled air bubbles on the bottom of the ice and an opportunity to try the unique sport of upside down, bottom of the ice, skiing. This is also a great way to help you get prepared for a trip to Antarctica. Our PADI Ice Diver certification class includes class, pool and under ice diving. In the classroom we will take you through the proper planning and preparation for ice diving and cover mandatory safety equipment and procedures. You'll then have an opportunity to practice line handling and safety procedures in the pool. 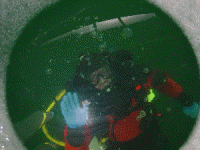 Over the weekend you will conduct three under ice dives to complete your certification. We'll dive from a custom made ice diving house to keep you warm and provide all special safety equipment (lines, harnesses, etc). Ice dives are at Square Lake near Stillwater, MN. For information on safety while on the ice, check out the Minnesota DNR Ice Safety Tips page. Prerequisite: PADI Advanced Open Water certification (Adventures in Diving) or qualifying certification from another organization and 18 yrs old. PADI Ice Diver Specialty Course Fee: $299 includes: Training fees and certification processing. Drysuits and other Scuba equipment not included, but may be rented (advanced reservations recommended). Complete a PADI Student Record File (which includes a Medical Statement). If you answer yes to any of the medical history questions, we must require a signed physicians approval before you participate. You can download and review the PADI Medical Statement here. Please print a copy to take to your physician for their approval and signature if required.